It’s not very unusual to be hearing terms as Amniocentesis peppered into conversations of pregnant women. Many Gynecologists are recommending this procedure nowadays. Most people are scared about amniocentesis and reach out to their doctor with a barrage of queries. I have compiled a list of 10 commonly asked questions from my patients for the larger benefit of the expectant couples. Amniocentesis, done by a Fetal Medicine Specialist, is a safe procedure and relatively less painful. It is a diagnostic test performed during pregnancy where a small sample of amniotic fluid is taken from the uterus. This sample contains cells from the fetus and it is analyzed in the laboratory. When is an amniocentesis usually required? If the fetus has higher than normal risk of Down syndrome. If any of the expectant couples’ previous baby is affected with a genetic disorder. If the couple or one or more of their relatives are either affected with a genetic disorder or are carriers of genetic disorders such as Thalassemia, Sickle cell anemia etc. 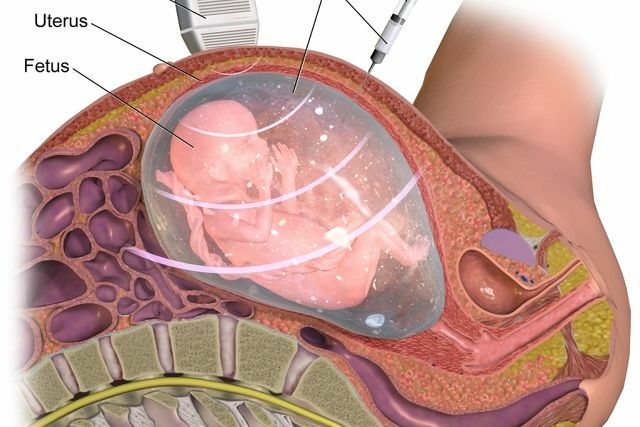 This procedure is performed by a Fetal Medicine Specialist. The Fetal Medicine Specialist will identify the need for such a procedure and provide thorough counseling to the expectant parents. This procedure is done under continuous ultrasound guidance, where the Fetal Medicine Specialist pushes a fine needle into your skin, through your abdomen and uterus to reach the pregnancy sac avoiding any contact with the fetus and placenta. Amniotic fluid is then aspirated using a syringe. The amniotic fluid sample has cells of the fetus, which can be utilized for genetic testing. According to most women who undergo an amniocentesis, the pain is described as being similar to that during a blood test. Usually, it is performed under local anesthesia to avoid any pain. Is there any associated risk? Amniocentesis is considered a very safe procedure; however, the overall risk of miscarriage is about 0.1% (1 in 1000). Specialised Fetal Medicine centers doing this procedure routinely have a lower risk of miscarriage. Hospitals do maintain their miscarriage records, and hence it is a good approach to ask your doctor about this. Can amniocentesis be done in twin pregnancies? Yes, it can be done in twin pregnancies. However, it is imperative to establish the type of twins (single vs different placentas). It is also very important to know which fetus each fluid sample has come from as your Doctor needs to know which baby is affected. This usually requires a high level of expertise and is best done at Specialized Fetal Medicine centers. What will be done with the amniotic fluid sample? The sample is sent to a genetic lab, where depending upon the reason, appropriate genetic testing is performed. The most common tests performed are FISH (Fluorescence In situ Hebraization) and Karyotype. FISH (Fluorescence In situ Hebraization) is a test that checks for common trisomy’s i.e. Trisomy 21 (Down syndrome), Trisomy 18 (Edward Syndrome) and Trisomy 13 (Patau Syndrome). The result of this test is usually available within 3 days. A full karyotype checks all the baby’s chromosomes and the results are usually available within 3 weeks. These tests provide a 100% confirmation of whether the baby is affected by any known chromosomal disorder. Occasionally more complex genetic tests would be required, which would be explained to you by your Doctor. Is hospital admission required for amniocentesis? It is an outpatient procedure and does not require admission. After the procedure, one can rest for about half an hour and can resume activities. In case of excessive pain, bleeding or breaching of the water bag, you must immediately contact your consultant physician. If your Doctor prescribes Amniocentesis, do not be scared. Go in with an open mind, find a good Fetal Medicine Centre and go through the test. The Fetal Medicine Specialist will clearly explain the test and will put you at ease. Through Amniocentesis you will find out extremely valuable details about your baby that can lead you to make informed decisions for you and for your baby.